This week was again a rather busy one, so not much time for the next article. All I have is a video of me playing Romeo and Juliet on that National Style-O (read style-“Oh”, the letter not the number, see this article for some detail pictures of this guitar), but there are no instructions or explanation. If you want you can check it out nevertheless, see below. This guitar is really nice. I had a steel-body Dobro before I got this one, it was the closest thing you could get in the late 80ies but it was nothing compared to the real thing. It is everything but easy to play, the neck is really huge, and you need a lot of left-hand pressure. It has many dings and dents, and the finish has been totally worn on some places. It is in much worse condition compared to Knopfler’s, and for this reason is not as valuable as his, actually it was comparingly cheap, less than one of those new Nationals. With exception of the plastic tuner pegs it is all original. Unfortunately the resonator had some cracks and tiny rips. I prefered to fix these with clear super-glue or tiny pieces of adhesive tape, instead of replacing the resonator. The sound on the video is recorded by the camera so it is not the best quality, and without a/b comparision it is probably difficult to judge, but everyone who played it liked it. Here is the video in youtube high-quality, if your internet connection is not fast enough, click here to watch it directly on youtube in standard quality. Unfortunately my high-quality videos have some sound artefacts (which the file I uploaded doesn’t have), no idea why (any help or suggestions are appreciated), it seems youtube uses some denoising algorithm that causes this. you say that you need a lot of right hand pressure… Maybe this is because you don’t have a truss rod on this one and can’t control the string action. You are right, there is no truss rod, but nevertheless it seems those fat old necks do hardly warp. The neck on this guitar is straight, but you cannot adjust string heigth easily because there is nothing to adjust. And – most important – you don’t want to have the action low on these guitars because they are great for bottleneck which requires a rather high action with heavy strings. So you’ve got to live with it. 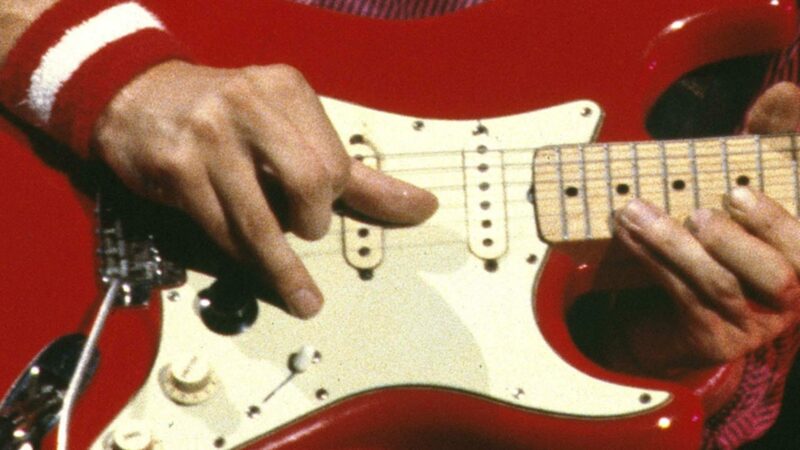 Hello, I accidentally came over this, and I wonder (sorry if it’s atupid question); is this actually Mark Knopfler’s guitar, or is it just the exactly same model as his? And if you bought this for yourself, what year is it from, and how much did you pay for it? I’m looking for a MK resonator copy myself (I can’t afford a real National), and I’ve found the Johnson JM-998S, which looks quite similar with the “Hawaii” engraving and all, but doesn’t cost very much.. This is not Knopfler’s National, but a model from the same year. I thought that was clear. It is – see the heading – from 1936, and it cost less than a new National some years ago. Yeah, I found the background info now, sorry for my stupid question earlier. Very nice playing, by the way! And a really nice instrument, I would like to have the original of course, but I guess it will be very difficult to find one, and if I did, I suspect it would cost too much, so I think I’ll go for the copy I mentioned..
I’m from Brazil, but I hope one day I’ll find one National Style like yours. what strings do you use for your national? I have medium .013 – 0.56 (factory setting) on my national and I find it a bit too heavy (not playing slide right now). I use 12s right now. I think Mark also plays 12 or 13 at the moment, but possibly much thinner (10s) in the past. Yesterday, I re-discovered the version of R&J that Mark played on 29/11/2000 in Graig Kilborn show, during the promo tour for STP. As far as I know, it’s the only time where he played it on a NORMAL ACOUSTIC guitar, at least it’s how it sounds like. No idea why he did it this way, he usually brings his national everywhere when he needs it, even on radio and Tv shows. Is it possible to get the song tab plz ? I never found the one with the capo 3rd. I found much tabs of this song but i never saw the one with the capo 3rd. That’s the one i would like to get. Strange, I’d have thought that ALL tabs are for open G tuning with capo at 3rd, it is something like common knowledge that it is played this way. It is in the official songbooks this way, too. I’d like to know if the Recording King resonator guitar sounds like the National styleO or not. Could you tell me ?